One cool feature located on your Samsung Galaxy tablet’s edge is an infrared remote. It’s a dark, glassy area about the size of a grain of rice. You can use that infrared hardware and the WatchON app as a super genius TV remote. Which comes in handy if you lose your remote a lot, and let’s be honest, who doesn’t lose the remote every once in a while? This is an order: Go into your TV room with your Galaxy Note or Galaxy Tab. Sit down in front of the TV. Start the WatchON app and follow the directions on the screen. Configure the app to match your local cable or satellite provider. Set up your TV set based on its brand name. 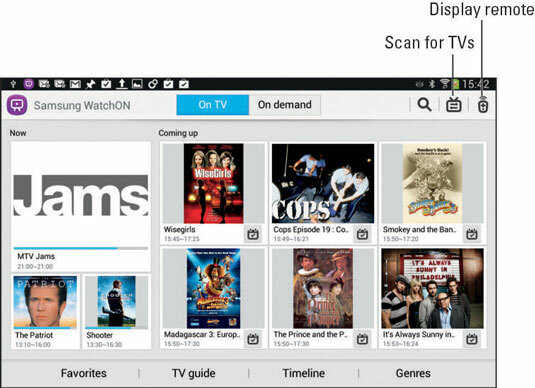 Eventually, you’ll be able to use the tablet running the WatchON app as your TV remote, but that’s only a minor trick. The big deal is the program guide that appears on the screen. As long as the tablet is pointing at the TV, you can touch a show on the screen to instantly switch to that channel on your TV. Or use the remote feature to control the TV’s volume or manually cruise the channels.